Mecham Outfitters is Southern Utahs premier Outfitter and Guide service. Hunts offered include Trophy Elk, Mule Deer, Cougar, and Black Bear on the Mt Dutton, Paunsaugunt, and Plateau Boulder units. 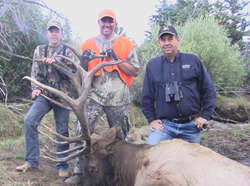 Mecham Outfitters is a premier Utah hunting guide operating out of the small town of Tropic. This town is situated right on the border separating the famed Paunsaugunt deer unit and the trophy Plateau Boulder elk unit. Also, the Mt Dutton elk unit, another of Utah's trophy areas, is only a short drive from their front door. Being so close to their hunting areas provides them the perfect opportunity to spend a maximum amount of time scouting and assessing the trophy potential of each unit long before the hunting seasons begin. You can be sure that they know what that potential is and where the best trophies are hanging out by the time you arrive in camp. Due to their small size, Mecham Outfitters offers a very personalized hunting experience. There is a very good chance that you will be guided by McLain him self. On the Mt Dutton elk hunts, they use horses to access their remote camp sites. These horses spend all summer packing tourists through the nearby Bryce Canyon National Park and Grand Staircase Escalante National Monument and are well suited to get you in and out of your hunting camp. The Paunsaugunt deer as well as the Plateau Boulder elk are effectively hunted on foot and camps are accessed via 4WD. Their pronghorn hunts are also set in these same areas and desert bighorn sheep are within a couple hour drive. Trophy deer, elk, pronghorn, and bighorn are not the only hunts they offer. 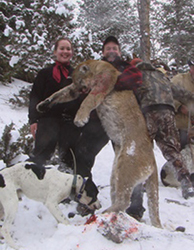 If you are looking for a Utah cougar guide, Mecham Outfitters is one of Southern Utah?s best. Once a track is cut, their pack of well trained hounds are set on the trail and then the real hunting begins. These dogs are also used when hunting Utah black bear. These are physically demanding hunts and can test even a well conditioned hunter. Check out their website at Mecham Outfitters or contact Hunters Trailhead for more details.